By now you’re well aware of the benefits of saving for your child’s education expenses in a 529 plan. But did you know that you can also use a 529 plan to save for yourself, no matter your age? 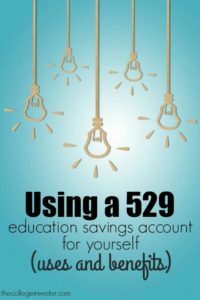 If you plan on furthering your education, such as going back to get a masters degree or even getting a certificate, here’s what you need to know about using a 529 for yourself. One of the biggest benefits of investing in a 529 plan is the potential tax savings. To top it off many states (34 in total) give their residents income tax deductions on contributions, up to a certain limit. You can find the list of states that offer tax deductions here. So, if you live in a state that offers a deduction, and you’re planning on going back to school in the next year, consider stashing some money in a 529 plan. The best case scenario is that you get a small tax break and your money grows a bit tax free. The worst case is that you just get the state tax break. Either way, a tax deduction is a tax break. Each state will set its own limit for how much in total can be put away in a 529 plan. However, there are no annual contribution limits set by the IRS. Also, the federal government allows single individuals to contribute as much as $14,000 per year or $70,000 for five years and avoid gift tax consequences. However, contributing to your own 529 plan isn’t considered a gift and you can contribute as much or as little as you want. Plans like ScholarShare allow for automatic contributions, which can make it easy to save a little each month until you achieve your goal. What If You Don’t Use The Money? If you contribute to a 529 plan but don’t use all of the money, you have a couple of options. First, you can change the beneficiary of the plan to your child, grandchild or spouse in the future. This could give you a big head start on saving for your child’s education. You won’t have to pay any taxes or penalties for doing so. Your second option is to withdraw the money. In this case you will have to pay taxes on the earnings plus a 10% penalty. In some situations you may also be required to pay back the state tax breaks you received. That sounds a bit scary, but realize it’s just 10% more on the earnings portion – you can always withdraw your contributions without facing any tax consequences. In certain circumstances, saving for your own education expenses is a fantastic idea. You’ll avoid paying taxes on the earnings, reap potentially large state tax benefits depending on where you reside, and you’ll have the ability to transfer the money to a different beneficiary (like your children or future children) if you don’t use the money yourself. Some plans will require you to have the account for at least a year before using it. You need to check plan fees and expenses to make sure that saving for the short term will actually be beneficial to you. Some investments are riskier than others so make sure that you are comfortable with where your money is invested. Research a plans performance before signing up. If you want to get started saving in a 529 plan for yourself, you can look at plans both in and out of your state for options that best suit you. Be sure to factor in all variables so that you come out ahead. 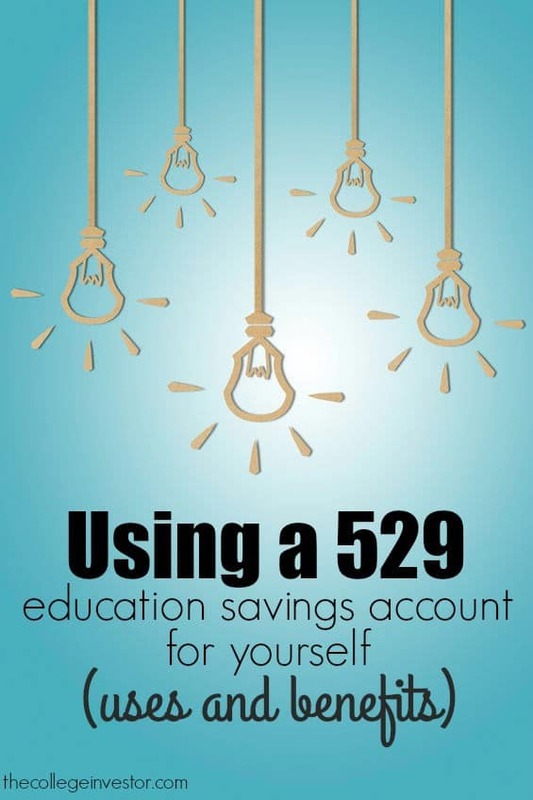 Are you using a 529 to pay for education expenses? Robert Farrington is a brand ambassador for ScholarShare. All opinions in this article are his own.